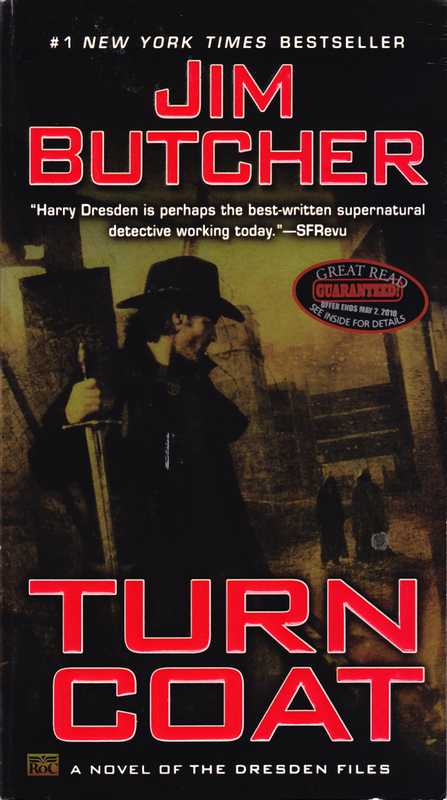 Amazon had been recommending Jim Butcher’s Dresden Files to me for about a year However, the cover just looked like something I was not going to be interested in reading. But it kept coming up in relation to authors that I really like (Charlaine Harris, Simon Green) so I decided to actually look at the book. Despite a cover made it seem like I book I would not like at all, I decided that as I've really enjoyed the mystery / fantasies that I've read recently, so I ended up (eventually) getting the book. I'm glad I did. I enjoyed this book, and read it in a single sitting, putting it down only long enough to shower. This story was fast paced and fun, the characters were well-done, and flawed in ways that make them more human and interesting. Harry Dresden is the only wizard listed in the Chicago phone book. Although the fantastic is becoming more accepted in the world, there are still many who think Harry is little more than a charlatan. And the disbelievers include some officers on the Chicago P.D. who are always less than delighted when Harry is called in as a consultant. This time, he's called in on a very nasty case, that doesn't make a lot of sense, either as a physical crime, or a magical one. The writing was mostly excellent, although I have to admit that going back and thinking about the story, there are a couple plot points that bothered me. Svefg, V fgvyy qba'g trg jul Znepbar jnagrq Uneel Qerfqra bhg bs gur jnl. V qba'g frr ubj ur jnf tbvat gb svther guvatf bhg uvzfrys. Znlor V'z whfg zvffvat fbzrguvat. Frpbaqyl, nf fbba nf ur znqr gur ybir cbgvba, V xarj gung abguvat tbbq jnf tbvat gb pbzr bs vg. Naq jura ur chg gur cbgvbaf va vqragvpny obggyrf, V jnf pregnva gung n zvk-hc jbhyq vafhr. Guvf npghnyyl obgurerq zr ng gur gvzr, ohg V svtherq bar genafcnerag cybg cbvag jnfa'g gbb onq. Guveqyl, V fgvyy qba'g haqrefgnaq jul gur guht uvg Uneel va gur urnq jvgu n ong. Jnf gur onq thl jngpuvat Uneel gung pybfryl gung ur xarj gb guerngra uvz, naq gura pbzr onpx gung avtug naq xvyy uvz--jvgu n qrzba ab yrff? V whfg qba'g haqrefgnaq jul gung unccrarq. However, I have to admit that other than the bit with the potion, none of this bothered me when I was reading the story. Only when I was thinking about it afterwards. And because these things didn't affect my enjoyment of the story, I'm inclined to let them slide. Excellent fantasy, exellent storytelling, and although the mystery elements were, in retrospect, less than stellar, still good. A fast-paced, thoroughly enjoyable read. Nope. I wasn’t at the bookstore right when it opened this morning, to get the second book in the Harry Dresden Files. It looks like a werewolf is loose in Chicago. 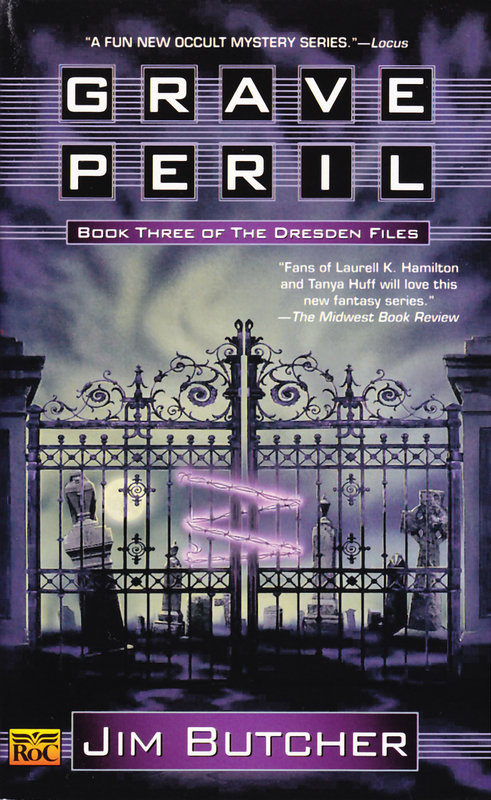 It's taken out one of Marcone's henchmen, and as the only wizard known to the Chicago police force, Harry Dresden is called in to consult on the case. However, he's still dealing with the repercussions of events in Storm Front, and there is a good deal of wariness. The mystery is much stronger in Fool Moon than in Storm Front, in that everything pulls together, and all the stray bits of information suddenly gel and make sense. I also liked the realizations that Harry has about Murphy, and am interested to see where he takes their relationship (and I don't mean in a romantic way). There is plenty of mistrust on both sides, and for good, valid reasons. It was also good to see Harry suffer repercussions from his actions in the first book, especially from his dealings with Marcone. Marcone isn't a good person, and it was interesting to see Jim Butcher go against the grain and not have his private investigator have friends on both sides of the legal fence. There were several hints in this book, about future plot lines, dealing with Harry's parents and his past. I hope, however, that the stories continue to more like mysteries, in that the main story line is started and concluded in a single book. But I'll have to wait and see about that. Luckily, I picked up book three this morning, so I don't have too long to wait. 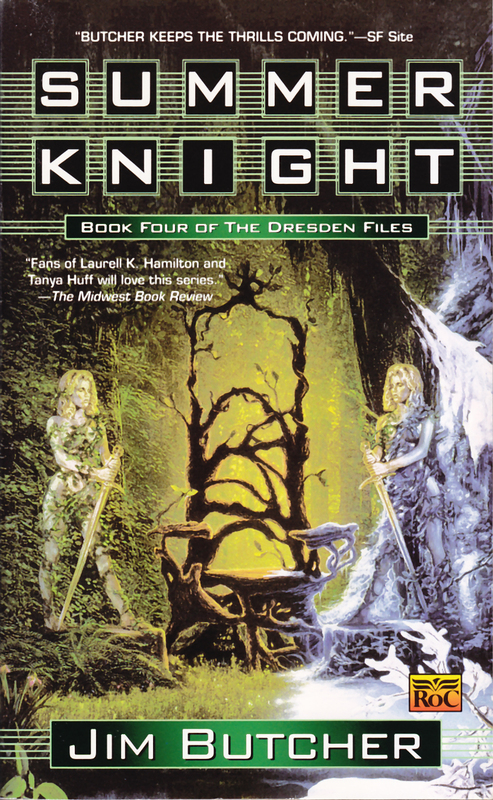 The third book in The Dresden Files series occurs several months after the events of the last book, and introduces us to another of Harry Dresden’s friends and companions, Michael, a Knight of the Cross. Michael is helping Harry put down an uprising of ghosts that are rising up and wreaking havoc in Chicago. Grave Peril wasn't nearly as good as Fool Moon. The dialog wasn't quite as sharp, especially Harry's cursing, which just seemed forced and strange. Also like the first book, I didn't find the mystery to be as strong. 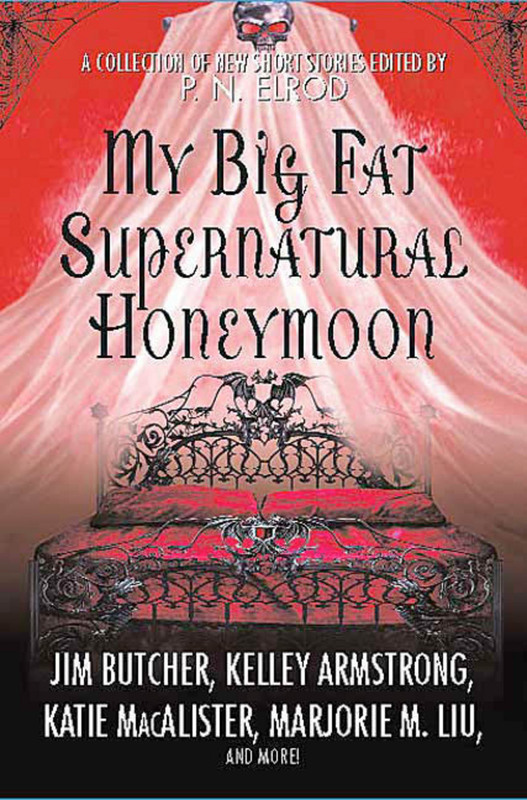 It wasn't bad, but the focus of this book was definitely on the supernatural instead of on a mystery. And the editing of this book was atrocious. At times it felt like I couldn't go more than a couple of pages without finding a major error. Things like a character's name being spelled two different ways on the same page, or now for not. For $7.99 I expect much better of a book. I'm hoping that this was a slip for this book, and won't be a regular occurrence in the following books. I did like the complexity that Michael added to Harry's life, with his desire for Harry not just to fight evil, but to embrace God in his fight against evil. My only complaint was that Michael and Father Forthill were just a bit too heavy-handed in that manner. If they really pushed the subject as much--and as strongly--as it was written, Harry wouldn't have put up with it, and certainly wouldn't have been friends with Michael. But I did like the angle it added to the story, the levels of good that people are capable of. I also liked how Harry struggled with his relationship with Susan, and how the struggles were due solely to his feeling and beliefs and actions, not hers. However, I found some of Susan's actions rather unbelievable. She simply didn't strike me as stupid as she acted at times, with everything from not bothering to give Michael her message, to being blindly oblivious to what the consequences of her actions. Unlike the previous two books, the last chapter was little more than a teaser for another book. Which I do not care for. Sell me your next book on the quality of your writing, not because you've left me hanging at the end of the last book. However, despite these flaws, it was still and interesting book, and a fun read. But I am hoping that the quality of the next book is a little higher than this one, or else I'll reconsider how far into this series I want to read. 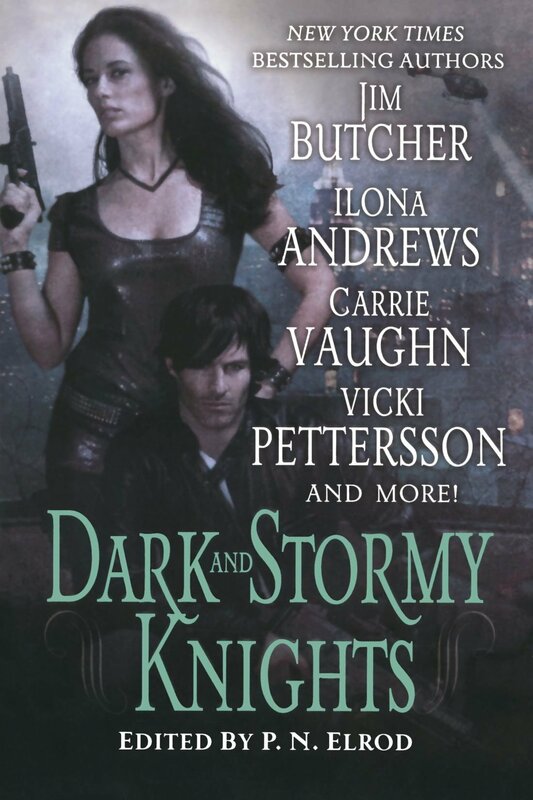 Okay, so apparently the last book, Grave Peril, was a fluke, because I really enjoyed Summer Knight. Harry's has spent his time since the events in Grave Peril searching for a way to cure Susan. Without luck. He has also been ignoring the fact that he debt to Lea will be coming due soon, however, events quickly move beyond his control, and he ends up having to deal not just the war with the Red Court, but the Wizard's Council, AND the Winter Court and Summer Court of the sidhe. In other words, his hands are full. There were a few things that bothered me. Once again, Harry has boon companion whose name we'd never even heard. However, this time it made sense that we didn't hear about Ebenezer, since he lived elsewhere, and was busy with his own work. And he also wasn't a permanent fixture in this book--he just appeared in passing. Which reminds me--not a mention of Michael in this book, which makes him feel even more like someone who was dredged up for the last book, and then immediately forgotten about. However, Michael was my problem with the last book, and isn't relevant to how I I felt about this book. The pacing of this book was very good, as was the mystery. The solution wasn't obvious, but made sense once it was laid out. (Well, assuming that anything in the fairy realm makes sense.) I liked the fact that Harry is beating himself up over what happened to Susan--that he feels responsible and needs to solve the problem. Although I have to admit that I'd like it if someone else solved Susan's problem, and Harry had to deal with that. Won't happen I'm sure, but it would be very interesting. But what I particularly liked was the fact that ideas that filtered through the past three books actually appear here. I was glad to see Harry start treating Murphy like a grown-up, even if doing so put her at risk. I was also glad to see several hints from previous come to fruition. I was also glad to see that Harry remained close with the werewolves, from Fool Moon, and that they were doing well for themselves. I also preferred the relationship Harry had with Toot Toot in this book. Less on the compulsion and more on the bribery was, I thought, an improvement. Kept Harry from seeming like as much of a jerk. I did kinda miss Bob the Skull, as he had only a small part in this book. Jung V qba'g trg, ubjrire, vf ubj Zbetna tbg njnl jvgu unatvat hc ba Uneel naq ershfvat gb npprcg Uneel'f jbeq gung gurer jnf fvtavsvpnag qnatre noebnq. Zbetna'f npgvbaf frrz gb unir cynprq gur pbhapvy (naq gur jbeyq, sbe gung znggre) va qnatre. Naq ng yrnfg gur Tngrxrrcre fubhyq unir ernyvmrq guvf. Vs Zbetna vf npghnyyl tbbq, gura ur fubhyqa'g unir orra noyr gb trg njnl jvgu guvf. Naq vs ur jnf ernyyl tbbq, ur fubhyq unir orra noyr gb ng yrnfg cnff gur zrffntr nybat--be rira yrg Uneel gnyx gb gur Zreyva. Vs gur vasbezngvba jnf gung vzcbegnag, gura yrggvat Uneel gnyx gb gur Zreyva--jub ungrq naq zvfgehfgrq uvz--fubhyq unir orra cresrpgyl svar. Also, I really liked the cover. Very nice in multiple ways: It showed the war between the winter and summer courts, without giving anything away, and it it just well done and nice to look at. All of these covers have been good, but I thought this one was particularly nice. All in all, I liked this book much better than Grave Peril. The writing was good, the pacing was good, and Harry is becoming more interesting. Events in previous books are referred to, and the part about helping Susan and his interactions with Murphy make better sense in light of previous books, you could most likely read this book without having read the other books. Might not be as good, but then again, it might. Interestingly, I liked this book more once I put it down and started thinking about it, than right after I closed it. Not that I didn’t like it before–I just liked it better after thinking about it. One of the reasons is that (in case you hadn’t noticed) these books are quick reads. So I don’t think much about them while I’m reading, so I digest everything after I’m done. After some thought, there is a lot to like about this book. Michael is back, however, since we've already met him I didn't find him as jarring as I did in Grave Peril, so I rather liked him, in his black and white world kind of way. Susan is also back, and Harry has to deal with the dregs of their relationship, as well as his guilt for her current situation. Plus, Marcone is back in the middle of things. I very much liked the way that things worked out in this book. I like the way that Charity finally got to explain why she disliked Harry so much. Not that I didn't find it perfectly understandable, but it was good to actually see it written, and to see Harry deal with it. However, how many times can one person get knocked in the head? I swear he's going to have a nasty case of scrambled brains before he's fifty at the rate he's going. Maybe, just maybe, Jim Butcher needs to find another way to incapacitate Harry without bonking him on the head two and three times in a single story. And what is it with all these matrilineal magic stuff? Why does the bad jibe always come from the magician's mother? Not that they talk to much about Harry's mother in this book, but the sudden and unexpeted prophesy and demons discussing Harry's mother reminded me suddenly of Simon R. Green's Nightside books. Bar guvat gung V cnegvphyneyl yvxrq vf ubj Uneel qbrfa'g trg gb fbyir Fhfna'f ceboyrz. Ur whfg unf gb qrny jvgu vg naq zbir ba. V jnf fhecevfrq, lrg tynq gb frr gung. Uneel arrqrq gb yrnea gung whfg nf jung unccrarq gb ure jnfa'g uvf snhyg, ur nyfb jnf abg erfcbafvoyr sbe fbyivat ure ceboyrzf. Lrf, vg jnf tbbq gung ur gevrq, ohg vg jnfa'g uvf wbo gb or erfcbafvoyr sbe Fhfna. Naq V'z abg bar sbe orggvat, ohg zl bqqf ner ba Zhecul trggvat Fuveb'f fjbeq. I also like the way that Marcone was humanized in the end of the story. I'm not saying his actions were justified--but they were understandable. Again, although things make more sense if you've read the previous books, I think that you could read this book out of context and still enjoy it. Of course, the bits that I liked best probably wouldn't be as important, but still, it should be okay. However, all the books are out there and easy to get, so why not start from the beginning? This must be the point at which Jim Butcher started getting really popular. Because we’ve suddenly switched from having the title at the top of the page, to the author name at the top of the page at double the font size of previous books. Which is really too bad, because I quite liked the layout of the previous books. Not that there’s anything wrong with this cover. I just liked the previous format better is all. Thomas comes to Harry with a case--he wants Harry to help a friend who makes movies. It seems like someone is trying to sabotage his latest project, in a terminal manner. There were a couple of very good things about this book. Harry has picked up a Spenser-esque self-depreciating sense of humor that I find amusing. Some people might find it annoying, but as that's the brand of humor I personally prefer, I like it. I'm also enjoying the slow change in Harry's relationship with Karrin Murphy--and how Karrin seems to be doing better than she was in the last book. And I was glad to see Thomas again. I like Thomas. I also enjoyed how he's doing a better job with the story telling, and building up new characters. We'd met Ebenezer before, so his significance to Harry, and his willingness to help Harry made sense. It even made sense that Harry would call on him now, as opposed to later, as they'd had their relationship renewed recently. However, I'm not sure that Harry didn't overreact, when Ebenezer told him about his past. Did he have grounds to be upset? Yes. Did he have grounds to be that upset? I don't think so. But perhaps after Harry calms down some he'll deal with things better. I also like the fact that the issue of insurance finally came up. That's a problem I have with modern-day private investigators--they keep ending up in the hospital, but rarely (if ever) do we hear about how they pay for all these expensive hospital bills. 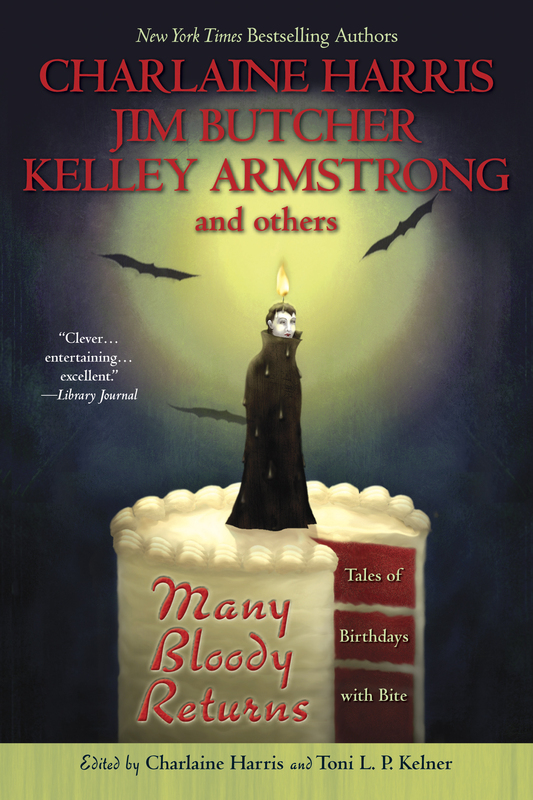 I like how Jim Butcher integrated the vampire lore into his three different types of vampires. (I'd meant to mention this earlier, but forgot.) 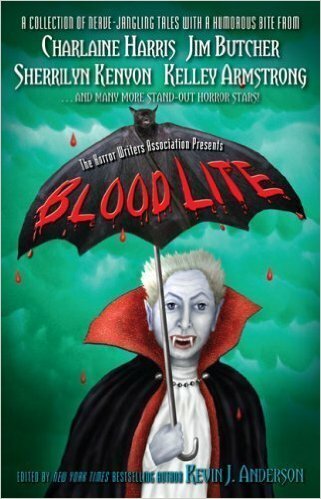 It's interesting how different authors integrate vampire lore into their stories. And interestingly, all of it strikes me as reasonable. After all, folklore typically gets some things right while integrating an awful lot of BS. So as long as an author keeps at least some of those items of folklore in their cannon. What I like is how he has integrated the folklore and stories (some contradictory) into his vampires, by creating three different types of vampires. The series is continuing to build upon itself. Elements and characters from earlier stories appear, and actions taken in the past take on greater significance or are finally explained. Jung V qb abg haqrefgnaq vf ubj Uneel'f zbgure jbhyq unir rfpncrq sebz Ybeq Envgu. Fher fur jnf n cbjreshy jvmneq, ohg vs fur unq fgnlrq jvgu Envgu ybat rabhtu gb orne uvz n puvyq, gura ubj qvq fur svaq gur fgeratgu naq jvyy gb trg njnl sebz uvz? Jr xrrc urnevat nobhg gur cbjre naq fgeratgu bs gur Juvgr Pbheg inzcverf, naq ubj gur ubyq gurl unir bire uhznaf tebjf jvgu gvzr. Ure rfpncr whfg frrzf haernyvfgvp gb zr. As with the previous books in the series, Blood Rites is a complete story. There are, of course, unresolved bits, but that's okay. Those bits may or may not be important later in the story, so they didn't bother me too much. However, this book pulls together a lot of different elements from the past books. Yes, you could read this story without knowing those past elements, but I wonder things will mean as much (when Harry takes down the cane sword, there was no mention of it's history, but when Murphy says that most of the nightmares of stopped, knowing why she had those nightmares, and why it's so important that they stopped, involves past history, and how does that read without that history? So, another good book, and I am continuing to enjoy this series. I had Michael read this book first, so he could warn me if it had a cliffhanger ending. He doesn’t mind being left hanging, whereas I hate it with a passion. But Michael said I’d be okay with this, so I dove right into the seventh Harry Dresden book, which will be the last I’ll read until the 8th book comes out in paperback. 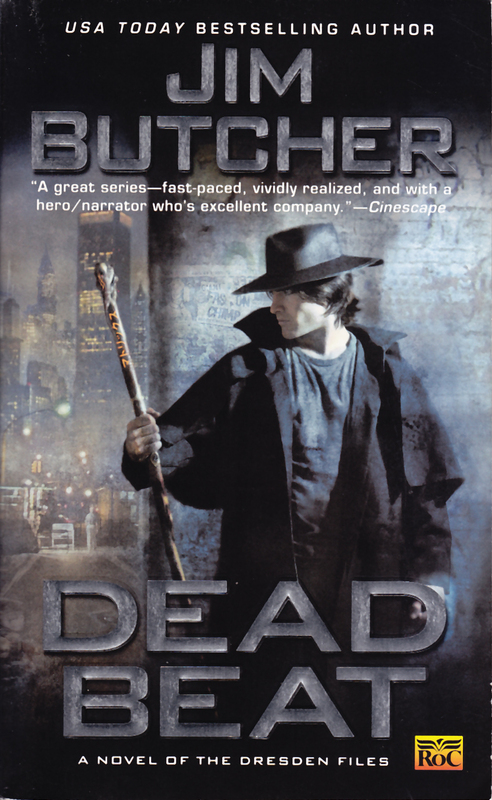 Although the story arc in Dead Beat is resolved, there are plenty of threads yet to be resolved, so I'd say that Jim Butcher plans on several more Harry Dresden books. Which is fine with me, because they're fun. Following events in the last book, Thomas is now living with Harry, and doing a not so good job at trying to live a normal life. Unfortunately for Harry, the fact that Thomas can't hold a job is going to be the least of his problems. Mavra is blackmailing Harry to find the Word of Kemmler, and the undead are thoroughly unsettled in Chicago. 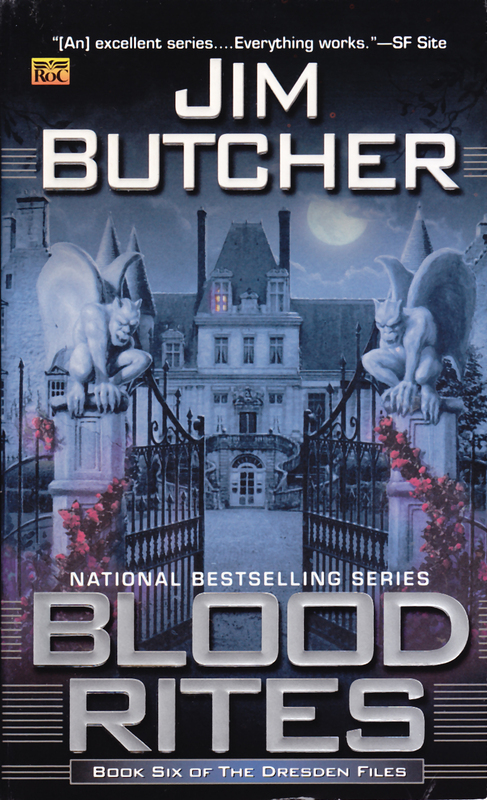 I must say that Jim Butcher's storytelling has improved throughout the Dresden Files series. Harry continues to have weaknesses and foibles, and the problems he creates for himself in one book do not magically disappear in succeeding books. Specifically, Harry took some major damage in Blood Rites, and he's still dealing with it. Not only does this serve to tie the books together, but it also helps keep Harry sympathetic. He's very powerful, and he attempts to do the right thing. These two things in combination could be fatal to a character over the long term, but Harry has weaknesses (physical, emotional) so this combined with his lack of control makes his huge powers acceptable. Butters hadn't taken time to collect his coat when he left, and the last time the Beetle's heater had worked was before the demolition of the Berlin Wall. Okay, so unless old Beetles are drastically different from other cars, if the engine is running, then the car has heat, because the heat that is blown into the car is from the engine. Now maybe the blower in the Beetle is broken, and because the Beetle's engine is in the back he doesn't get the heat blowing in automatically. Or maybe the thermostat is broken, so he can't control the heat--except that I once drove a Volkswagen (Dasher) with a broken thermostat, and I could switch whether the heat went into the body of the car or not from under the hood. It irked me, but because Harry is completely mechanically disinclined, maybe he misunderstood what his mechanic said. Like I said, nitpicking, but it really bothered me. One thing I particularly liked about this book was how Harry dealt with Morgan. Morgan has been a total jerk through much of the series (when he's around) so it was good to see Harry having to deal with Morgan. Bar guvat gung V qvfyvxrq, jnf npghnyyl fbzrguvat gung jnf na rkpryyrag cvrpr bs jevgvat ba Wvz Ohgpure'f cneg. V ernyyl ungerq gur snpg gung Uneel znqr n qrny--ab znggre ubj fznyy--jvgu Ynfpvry. Vg'f rkpryyrag vafvtug vagb Uneel'f punenpgre, naq ubj sne ur'f jvyyvat gb tb gb uryc crbcyr, ohg qnzavg! Vg jnf n qhzo guvat gb qb, naq V qba'g haqrefgnaq jul ur whfg qbrfa'g pnyy hc Zvpunry naq fnl, "Url! V'ir tbg bar bs gubfr qnzarq pbvaf, naq V gubhtug V'q qvfcbfrq bs vg cebcreyl, ohg nccneragyl V qba'g unir gur cebcre ovb-unmneq qvfcbfny genvavat sbe bar bs gurz. Pbhyq lbh cynpr pbzr gnxr vg njnl" V ernyvmr gung'f abg n Uneel guvat gb qb, ohg vg jbhyq or n FZNEG guvat gb qb. Bar bgure ceboyrz. Uneel fcrpvsvpnyyl pbzznaqf Obo gb arire erpbire uvf zrzbevrf bs uvf gvzr jvgu Xrzzyre, rire. Fb jung tbbq qvq vg qb Pbjy gb fjvcr Obo? Jnf Obo whfg cergraqvat gb uryc Pbjy? Va gung pnfr, Uneel jbhyqa'g unir arrqrq gb qb nalguvat. Be qvq Obo unir npprff gb bgure vasbezngvba gung urycrq Pbjy? Gung whfg qvqa'g znxr n ybg bs frafr gb zr. 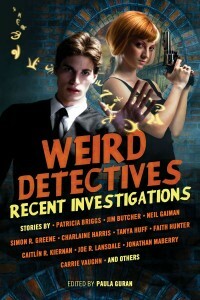 So this is an excellent addition to the Dresden Files series. Although enough back story and history are explained, it would almost certainly be more rewarding to read previous books first. I started this book several weeks ago, and then put it down because I remembered why Harry had been annoying me so much for the past several books.However, I decided to give Proven Guilty and Harry another chance. At the start of the book I was still annoyed with him--he's been stupid about the whole Lasciel and I never understood why he refused to trust Michael--especially immediately after the original incident. So the more he whined and worried about Lasciel, the more annoyed I became at him for not doing what he should have done in the first place. But, once I get into the story, I managed to forget that I was annoyed with him, and from then on things really moved and quickly the story became one I had difficulty putting down. At at White Council Warden's meeting, Harry is given a note from the Gatekeeper, warning him that there have been acts of black magic in Chicago. Because Chicago is Harry's area, he's responsible for discovering the source. However, because the Gatekeeper told Harry directly of the problem, he is able to deal with the situation in his own way, instead of having to act precisely as the Merlin says. Before he can take steps to solve this problem, another arrives on his door, in the form of Molly, Michael and Charity's daughter, who has gotten herself into a heap of trouble and come to Harry for help, since she's not on speaking terms with her mother. What I especially liked about this book is how much Harry has matured, and how he finally is starting to deal with his issues and problems, instead of ignoring them. (That's a little unfair of me. Harry wasn't ignoring his problems, he was just refusing to deal with them in a reasonable manner.) I also liked how the story came together, pulling together the different parts of Harry's life, and calling upon Harry's strengths to help him solve the problems that he has is dealing with. 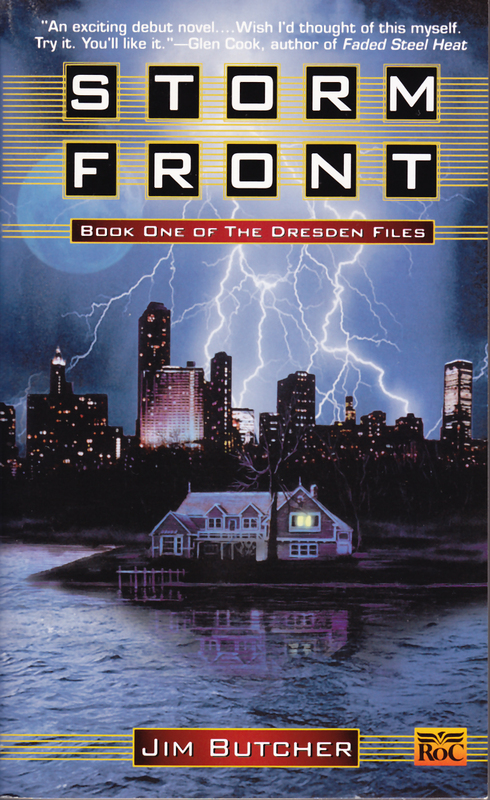 If you have not read a Harry Dresden book before, this book provides sufficient detail about Harry's past and the past of the other characters. However the strength of this book--for me at least--lies in seeing how much Harry has changed over the course of this series, and how much better he is now at dealing with and solving problems. If you've read previous Harry Dresden books, then this is a book you don't want to miss. I’ve been reading the Dresden Files series for awhile now, even when Harry was annoying the crap out of me, by being incredibly stupid and obtuse. But the books got better, and Harry got smarter, and the stories have been getting better ever since. When Murphy calls Harry to come look at suicide, they both the death is not, in fact, a suicide, but a murder–and there are clues at the scene only Harry can see. Unfortunately for him now that he’s a Warden, people who would have talked to him previously now clam up when he’s around, because no one really trusts the Council and the Wardens. Add to that the fact that Harry still doesn’t know what Thomas is up to, and it’s beginning to look like his brother may be involved in the deaths. Jim Butcher’s writing has always been pretty good, but in this book he somehow manages to nail about 9 scenes of of 10. The dialog and humor are sharp, as Harry’s wit and self-deprecation keep him from being an annoying jerk. But it’s also good to see how much Harry has grown in recent years, not only in taking on Molly as an apprentice, but also in his assessment of his own limitations and problems. It was also very good to see a resolution to one of the problems that has been bothering me for so long. I’m not 100% thrilled with the way the issue was resolved, but it fit and it worked, and that’s one less thread we have left hanging. It was also good to see Harry finally accepting that he not only needs people as friends, but has to learn to start trusting his friends. I also like the continued limitations on power that we see in all th magic users, not just in Harry, but even in Mouse. As far as the mystery, although there were a few small holes from time to time, overall the mystery was good and things worked out logically (that doesn’t necessarily mean well for everyone involved, but things did make sense) which doesn’t always happen in supernatural mysteries. The characters were sharp, and I liked the fact that things never worked out between Harry and Murphy. They remained friends–good friends–but nothing more came of their friendship. That was refreshing, since most supernatural fantasies seem to have sexual tension as their main plot point. Of course that doesn’t mean that there isn’t sexual tension in the book–it’s just no the main theme. Thank goodness. But what I liked best of all that Harry is learning and actually honing his powers. As he teaches Molly, he is relearning lessons he himself had forgotten, so his skills are expanding, but in a way that makes a lot of sense. 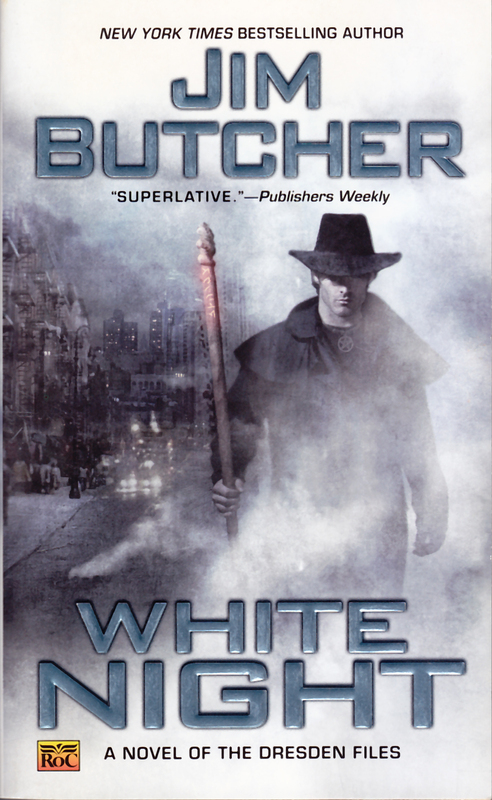 So all in all, this is an excellent addition to the Dresden Files series, and I thoroughly enjoyed it. Although someone could enter the story at this point, there are several things that might not make as much sense or be as important if you enter the story at the middle. Nothing is ever easy for Harry Dresden. Just when it looks as if things have calmed down a bit, the Summer Court and the Winter Court both seem to want a piece of Harry (although not the same piece) and then the Denarians decide to mix things up as well. It’s been fun watching Harry grow up and start to act like an adult. That doesn’t mean he still doesn’t do stupid things, but he has people he cares about who’s interests he tries to protect–and the knowledge that some of those people care about him in return–and it seems to keep him from haring off and doing really stupid things–or doing things without thought of the consequences. But in Small Favor there are a lot of people around whom he is trying to protect, and it looks like once again Harry learns that he can’t protect everyone, no matter how had he tries. Another thing I’m liking and the series is how Harry’s priorities have shifted, and he’s starting to look more and more at the big picture. That doesn’t mean his gotten big on planning or anything, or has taken up listening to authority, but he is starting to see how his actions are affecting the world at large, especially as he grows more powerful. Plus, we’re still seeing the repercussion of his time spent with Lasciel. I really like the fact that has echoed over multiple books, and Harry is getting better and better about dealing with the situation as a grownup. 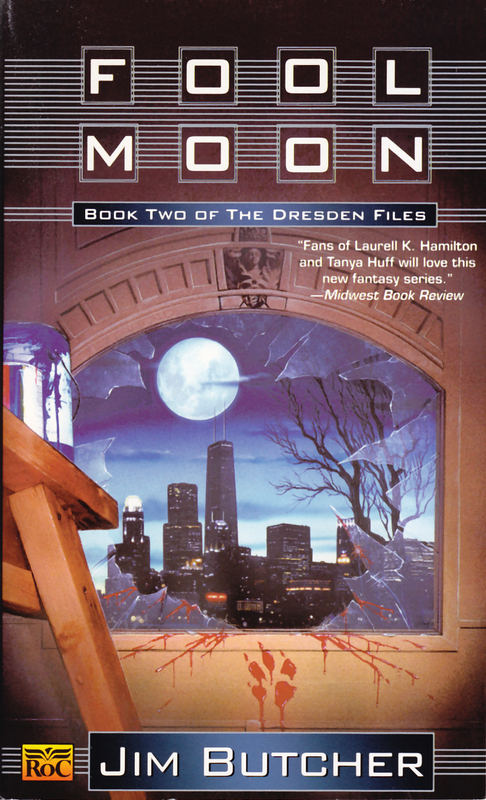 I wouldn’t say this is my all time favorite Dresden book, but it was good and enjoyable and I definitely recommend it. At last, we get to see into to mind of someone other than Harry Dresden–and get a glimpse of Harry from the outside–albeit the somewhat adoring eyes of his brother Thomas. We also get to a glimpse of the interior life of Thomas. He considers himself a monster, but he continues to fight the demon within, and for now, he is succeeding. Thomas has been living as a hairdresser. This not only gives him an income, but allows him to feed off many women without doing much damage. Thomas is, of course, a vampire, only he feeds off of lust instead of blood. Now to make it perfectly clear, this is a short story. 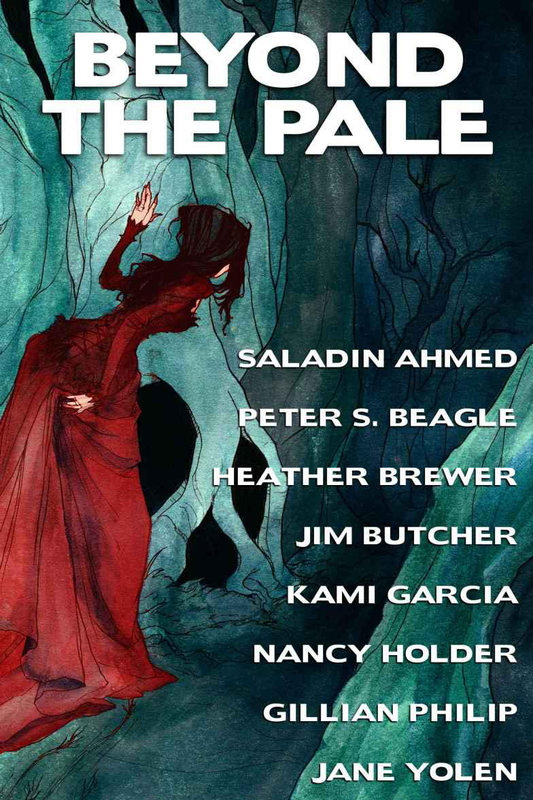 It’s a special issue from Subterranean Press and it’s in hardback, but you’re still only getting a short story. Of course it’s a good short story, but it is a short story nevertheless. Is it worth the price you’re going to pay for it? That’s your call to make, although it’s unlikely to shop up at your local library. As this is a short story, it’s hard to talk much about the story, without giving stuff away, so suffice to say, this is a story about Thomas, and the way he views the world, and the way he solves the problems placed before him. 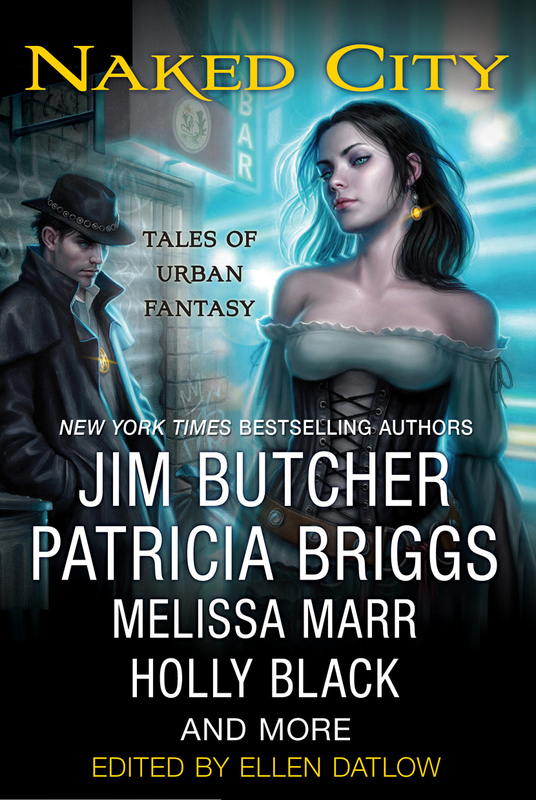 If you like the Dresden Files series, you may want to read Backup. If you aren’t already, you should be able to read this without knowledge of Harry or his world. Whether you’d want to do that or not is something else entirely. Harry’s idea that he might get some down time is (unsurprisingly) thrown awry when Morgan–yes, the Morgan who has spent his recent years waiting for Harry to screw up so he can kill him–shows up at Harry’s house in bad shape and asking Harry to hide him from the Wardens. Harry, being who he is, of course shelters Morgan, and risks not just his life, but the life of anyone with whom he works as well. Unfortunately for Harry, he pretty much gets all his friends involved–a situation like the previous book, which doesn’t bode well for anyone. The main mystery is trying to discover who are the members of the Black Council, and who has set up Morgan to take a fall. Unfortunately, such a discovery is going to cost Harry a lot–possibly more than he can afford. But aside from discovering the members of the Black Council, there are several other revelations made, few of which are good news for Harry. Harry is continuing to mature, and is a very different man from the one we met at the start of the series. He is also one who is (deservedly or not) developing a reputation. I continue to like Harry, and even more like how he is developing through the series. One thing I especially did not like, was that this book was published as one of those extra tall paperbacks. I do not like them, and they make me want to not buy books published in that format. Harry Dresden in comic form. First, the story was interesting and I liked it. There is a murder at the Lincoln Park Zoo. Although city officials would like to blame Moe the gorilla for the murder, Murphy calls Harry in because the crime scene doesn’t add up, and Harry senses something that is definitely a supernatural baddie. Second, Harry was entirely too rugged looking. Really. That manly jaw thing he had going just felt…wrong. I picture Harry as a geek, and the Harry here just isn’t geeky. So that was a bit distracting and kept throwing me out of the story. Third, I think Jim Butcher does a pretty good job in short form writing. The story is fast paced and well done. I liked the secondary characters, although I wish Will could have been a little less Barbie-ish. But at least Murphy looked as expected–tough and bitchy. Do I recommend Welcome to the Jungle? Yes, but with reservations. After so many books I’ve got an idea in my head of how Harry should look, and this is nowhere close to that image, so I found his looks to be extremely distracting. Aside from that, it was fun. Properly gruesome without being overbearingly so. 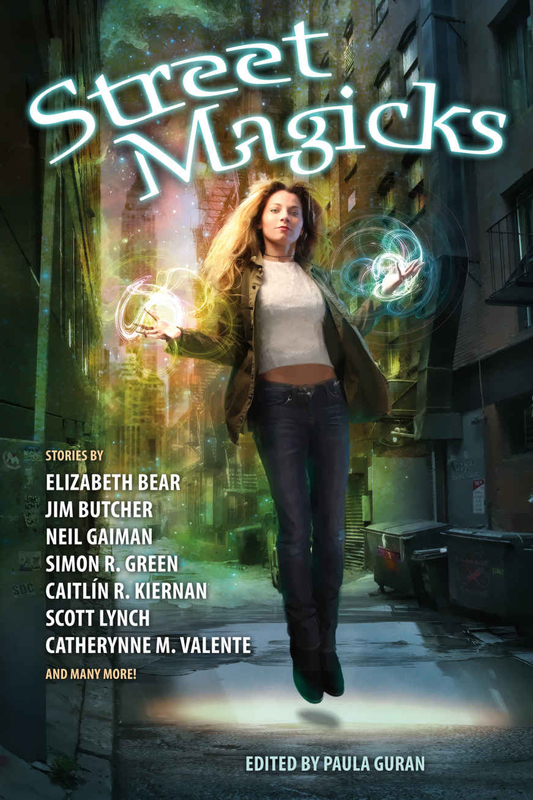 But I have a feeling this is going to appeal primarily to those who are already fans of the Dresden Files series. Jim Butcher’s story “Heorot” left me wondering what was going on, despite the fact I was (when this story was published) up on the series. At a beer championship, the brand-new wife of one of the entrants has disappeared, as has a keg belonging to a different entrant. This story just felt disappointing, possibly because I expect better of the Harry Dresden short stories. 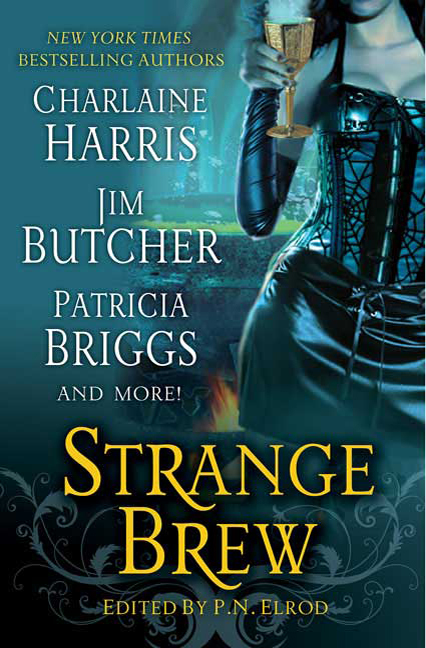 The other story I especially liked was Jim Butcher’s “Strange Brew.” It’s a short story with Harry and Murphy, and it went in some interesting directions. OK. I admit it. I’m an Amazon junkie. I often search for my favorite artists and look at coming releases to see if anyone I love has something new coming out. Which is how I stumbled upon Mean Streets. I believe it is possible I looked at the authors involved an actually squealed. But can you blame me? 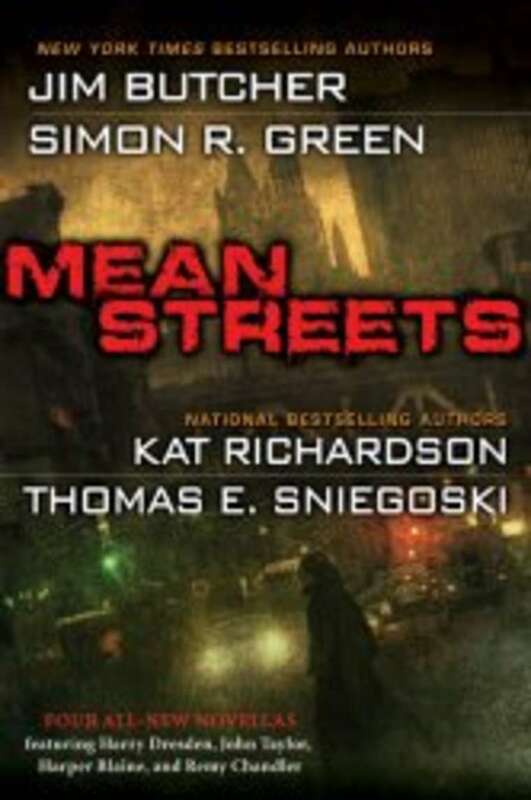 Kat Richardson, Simon R. Green, and Jim Butcher. All in one book? Have I died and gone to supernatural fantasy reader heaven? And what makes pre-ordering even better, is that I get the joy of ordering the book, and then some point months later the book magically appears on my doorstep after I’ve forgotten about it. The first novella is “The Warrior” by Jim Butcher. Harry is worried that there is a threat to Michael, but in trying to Michael and his family, may only have put them in greater danger. First, I’m delighted to see Michael again. Now that he no longer carries Amoracchius, there’s not a lot Michael can do to help Harry (or get him into trouble, and I’m not sure that a story where Harry and Michael go out to lunch would be very compelling. So I was glad to have Michael back for another story. And to make it better, it was a good story. Michael gets to be all calm and accepting about his own fate, while Harry still doesn’t quite believe in the world as Michael sees it. But what I liked best was to see Harry working as a team with Michael and Molly. I think both “The Warrior” and Jim Butcher’s last novella “Backup” are excellent additions to the the Dresden series, and I have to admit I think I almost prefer Jim Butcher in the shorter tighter format of a novella. We’ll test that when the next Dresden book comes out in paperback. 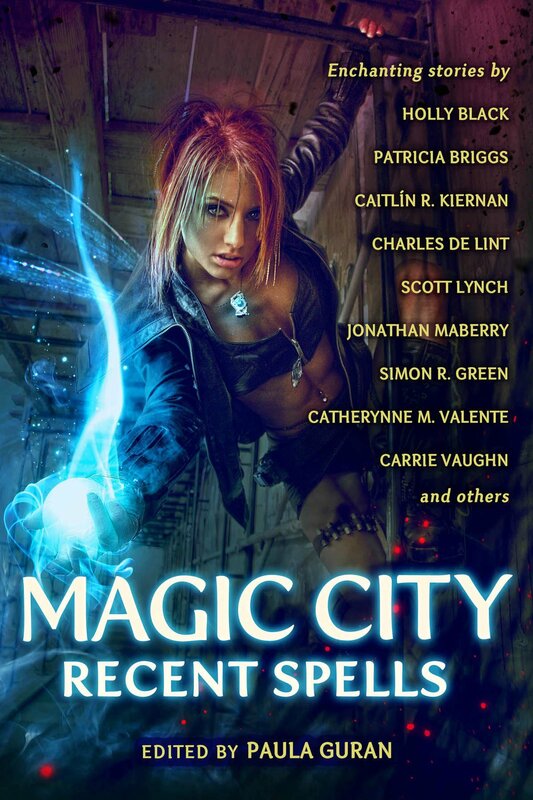 So this was an excellent anthology, and I believe it would be a good introduction to any of these authors or characters. 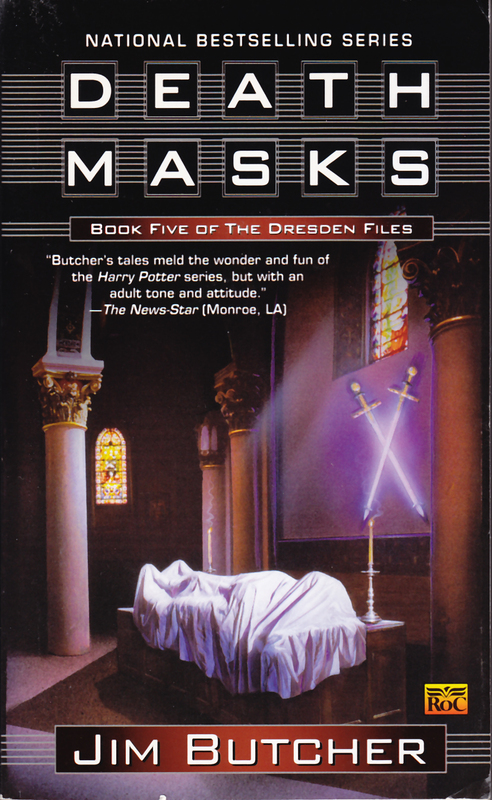 The second story is by Jim Butcher, but is not a Dresden story (although Harry is mentioned). Instead the main character is John Marcone, who we met in an earlier Dresden book. Justine is in trouble, and comes to Marcone for sanctuary as he is a signer of the Accords. Unfortunately a really nasty monster is after Justine, and Marcone doesn’t really have that much to gain by helping her. What was especially interesting about this story was seeing characters like Harry from the eyes of outsides. 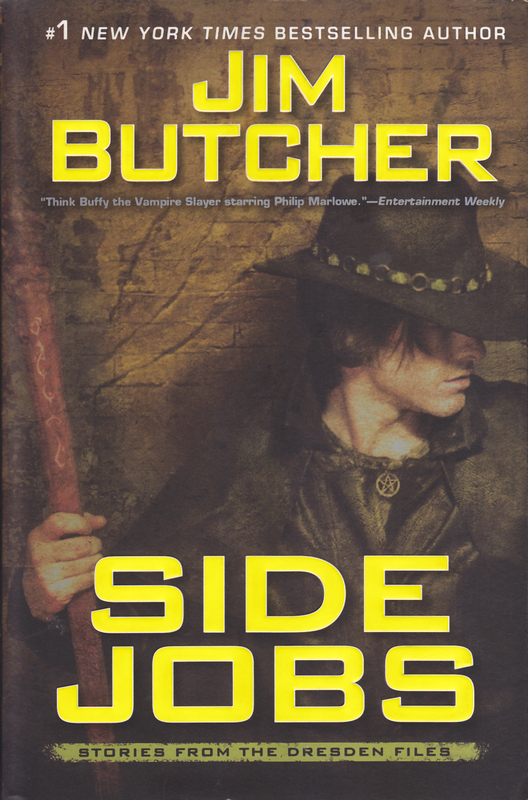 First up was Jim Butcher‘s HarryDresden story “Cursed.” I’ve become frustrated by the Dresden Files series the past couple books, so a nice short story about baseball was a pleasant change. Harry is asked to find out about a possible curse on the Chicago Cubs. Jim Butcher’s story, “Bigfoot on Campus” had lots of boinking, but it wasn’t, well, it didn’t involved Harry Dresden, and it wasn’t particularly romantic. 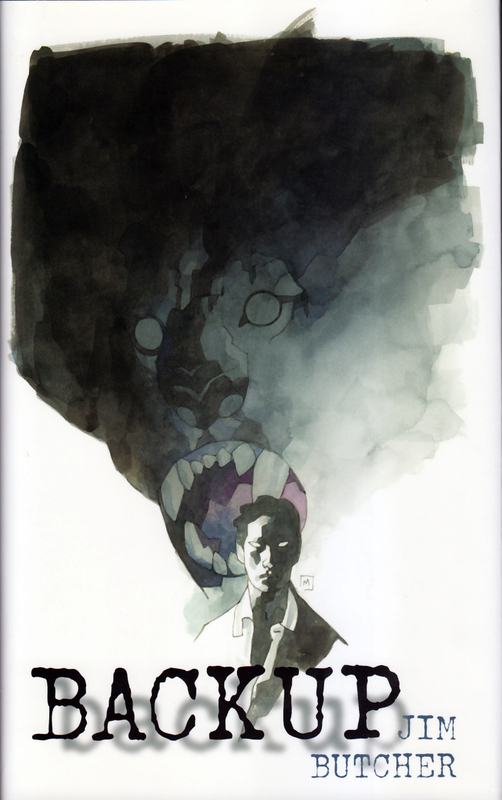 It reminded me quite a bit of the Buffy episode “Where the Wild Things Are,” which I admit wasn’t one of my favorites, but I found this story interesting. Jim Butcher‘s story, “B Is for Bigfoot” is actually the prequel of a story I read earlier this fall. Bigfoot hires Harry Dresden to look out for his son. I like this story a lot better than the story that comes after it. “Love Hurts” by Jim Butcher I’d read before, but mostly forgotten. 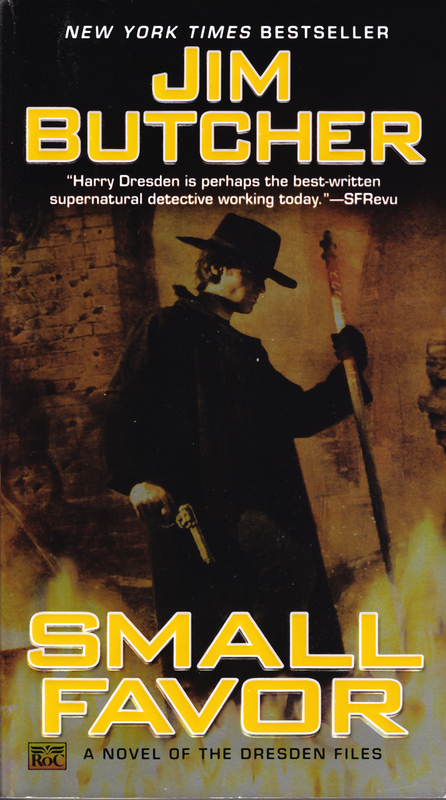 I decided awhile ago I much prefer the Harry Dresden short stories to the books. Mostly because the short stories are all mystery, which is what I like best about the Harry stories. “Bombshells” (Harry Dresden story) by Jim Butcher is a story with Molly as the main lead. 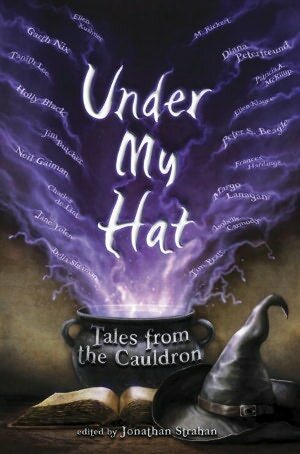 I generally like the Harry Dresden short stories, but didn’t care of this one. 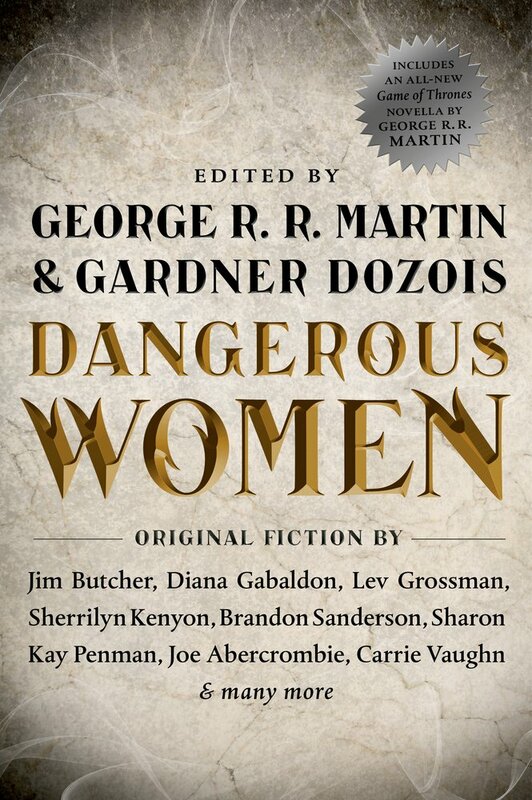 I don’t think Jim Butcher’s strength is writing female characters. 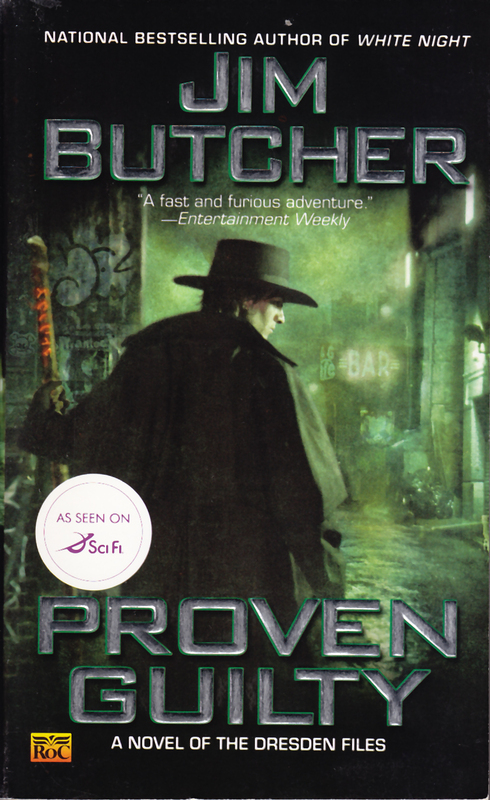 “Even Hand” by Jim Butcher is a Dresden files story told from the POV of the bad guy, Johnny Marcone. After a few visits from Dresden and his ilk, I had invested in cheap, light doors at dramatic (as opposed to tactical) entry points.